The Star pendant necklace and bracelet set is strictly reserved for stars, this set is far too good for anyone else! Each necklace and bracelet features a gorgeous highly polished star charm that is five pointed and has a solid small silver circle fixing ring. Above this sits two further rings leading to a beautiful solid sterling silver chain that is heavy enough to feel the quality of craftsmanship but light enough for everyday wear. This charming star charm bracelet and necklace set has a UK hallmark on the largest ring. The bracelet features a hoop and pin fastening with a chain that is approximately 18cm long. The star charm pendant necklace also has a hoop and pin fastening and is approximately 41cm long with the same quality chain. The star charm pendant on each is approximately 18mm wide and tall with five points. If you are looking for a bracelet and necklace set that is high quality with full UK hallmarks then this is perfect for you, only for real stars though!!!! Highly polished UK hallmarked 925 solid sterling silver necklace and bracelet set. Features a five pointed solid star charm that is 18mm tall and wide. The main necklace chain excluding hoop and pin is approximately 41cm long. 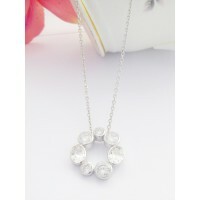 The necklace chain in the same design is approximately 18cm long.